Are Italian Public Debt Forecasts Too Optimistic? Italy has the third largest stock of public debt in the world, the second in the euro zone next to Greece and the highest debt service ratio in the G7. The last point is particularly important to understand the difficulties of managing Italian public debt. Japan holds roughly twice of the Italian public debt, but it spends less than one percent of GDP to service its public debt while Italy spends 5.4 percent of GDP. The burden of interest payments and slow growth have heavily contributed to enhancing the weight of debt, developing a dangerous vicious circle. However, there are several optimistic forecasts on debt dynamics (IMF, European Commission, OECD). This is the result of the deep efforts which have occurred in recent years, in particular since 2012. The objective of this post is to discuss the projections of Italian debt under scenarios simulated by the OECD, IMF and others. To do this, it is required to understand debt sustainability, analyzing short concepts about it. Above is the standard equation which describes changing debt-to-GDP ratio (see Blanchard (2010) or Farmer(1998), Macroeconomics). This equation states that debt changing is the sum of two terms. The first represents the difference between real interest rate ( alternatively ) and rate of growth multiplied for the outstanding debt. So if the real interest is higher than growth the debt level will increase and vice-versa. The second term is the primary balance. When public spending is greater than revenue the debt level will rise. Summarizing, if the rate of growth is lower than the real interest rate, to avoid increasing the debt-to-GDP ratio, governments need to make the relevant primary balance. Instead, when “g” exceeds “r”, even with public deficit, debt dynamics will be sustainable. As it will be fairly easy to understand, the last instance does not concern the Italian case. Unfortunately the high level of interest expenditure and the low growth forces it to obtain positive primary balance. Since 2012 Italy has improved its fiscal situation (Figure 1), setting the condition to reverse the debt-to-GDP path when growth returns (OECD survey, 2015). The budget balance, without interest payments and adjusted for the cycle, has improved by 4-5% since 2009. The Ministry of Economic and Finance estimates that structural budget will reach balance in 2017. If that occurs, Italy should obtain about 4.2% of the primary structural balance in the same year. Sustaining this strong fiscal position will depend to a large extent on Italy’s ability to keep the confidence of financial markets and to secure low risk spreads (see OECD report). The massive program of assets purchased by the ECB (quantitative easing) follows this way, boosting upward asset prices and cutting interest. Nevertheless extraordinary events (Greek insolvency) would lead to “uncharted waters” as warned by Mario Draghi. 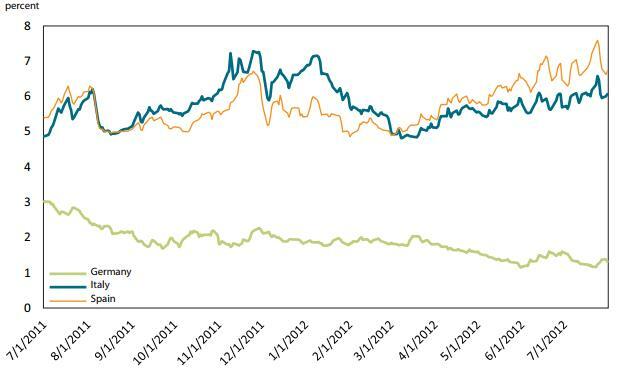 It could frustrate QE inducing interest rate volatility. Following the OECD, the forecast output gap would close in 2017, so that debt would fall steadily, reaching 60% of GDP soon after 2030 (Figure 2). Also, the IMF (see World Economic Outlook, 2015) assumes a decreasing debt-to-GDP ratio by 2016 (Table 2) arising from a lower expenditure matched to a growth return. Two questions undermine these results: Italian ability to improve the efficiency of public spending and the threat of interest rate volatility (see W.R. Cline Sovereign Debt Sustainability in Italy and Spain: a probabilistic approach or a summary on VOX). The spending review estimated (on what it described as conservative assumptions) that the ratio of primary spending to GDP could be reduced by as much as 2 percentage points by 2016 (Commissario straordinario, 2014). These are large savings. Unfortunately the delay to implement reforms ( e.g. public administration’s reform) reduces the amount of savings estimated. Furthermore the persistent phenomenon of tax evasion (180 billion, 27% of GDP) is not helpful. If growth turns out to be weaker than expected, the risks of revenue shortfalls and spending overruns will rise. The second item concerns interest rates’ randomness. It is worthy to note the vulnerability shown in 2011 by the Italian government (Figure 3). The fear of “Grexit” (Italy have invested 40 billion in Greek debt) could revive the same situation. If Greece misses the payment, it will be the first developed nation to default to the IMF. After that European periphery spreads could widen. A Goldman Sachs analyst guesses around 3.5 and 4 per cent on ten year government bonds of Spain and Italy respectively (WSJ). In conclusion, the current stillness does not mean the storm is ended. 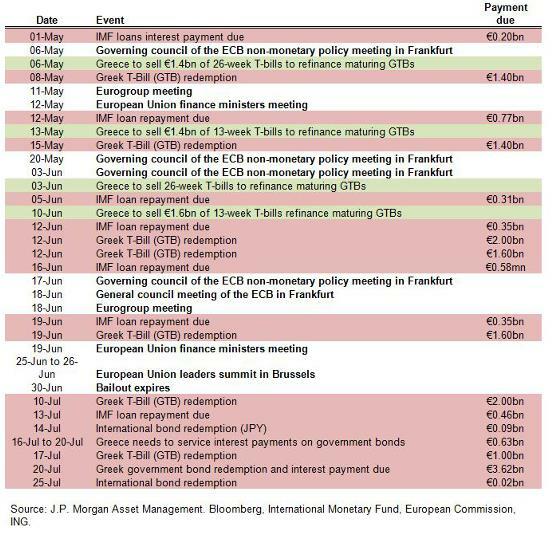 QE’s effectiveness strongly depends on upcoming events (above all principal payments due from Greece, Table 3 ). Unforeseen choices by Athens would upset any scenario considered up to now. Giuseppe Bianchimani is an Italian student of Economics at Guido Carli Free International University for Social Studies (LUISS) in Rome. He is a blogger for “Il Fatto Quotidiano” (personal page). His work concerns politics and economics, focusing on the Italian case and the Eurozone, and specifically concentrating on sovereign debt crises and debt sustainability. He tweets @pinoblanco93. 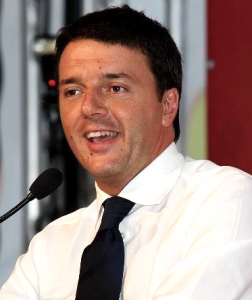 The 1000 Day Agenda: Can Renzi Deliver? This entry was posted in Euro, Greece, Italy and tagged debt crisis, debt-to-GDP ratio, Euro, Eurozone, growth, Italian economy, Italian public debt. Bookmark the permalink. One Response to Are Italian Public Debt Forecasts Too Optimistic?